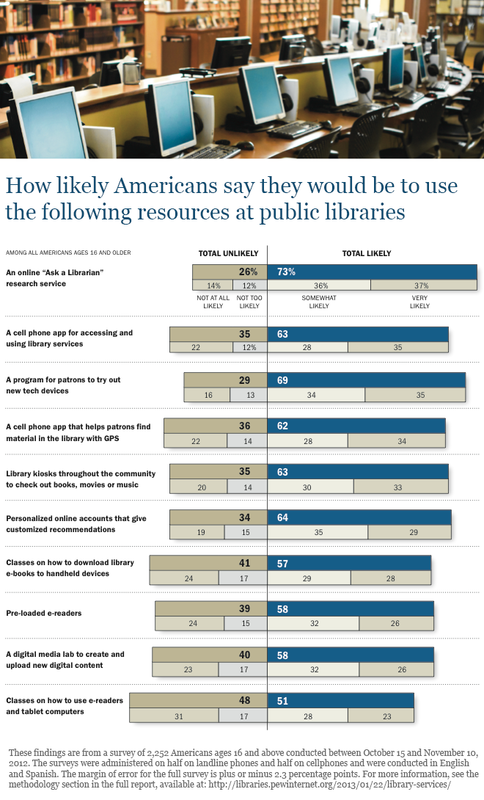 For our recent report on library services, we asked respondents whether they would themselves use a variety of possible new activities and features at libraries (if their library does not already offer them). Our list was weighted towards services that are rooted in technology and allow more tech-related interactions with libraries and at them. The results were mixed in several senses. There was no overwhelming public clamor for any of the activities. Still, there was fairly consistent interest in them and there was a notable segment of population – a quarter or more of respondents – who said they would definitely use each of the activities we queried and most times more than half the public said it was at least somewhat likely to take advantage of these new services. Many of those who responded to this battery of questions picked different types of services that they would prefer – in other words, there was only modest share of respondents who said they would “very likely” use each and every one of the news services that we queried. Overall, blacks and Hispanics are significantly more likely than whites to be interested in all of the services we asked about. Older adults, especially those ages 65 and older, are the least likely age group to express an interest in any of these services. Respondents with the lowest levels of education and living in households making less than $30,000 per year are also often more likely to express a strong interest in these services than more educated respondents or those living in higher-income households. Looking at differences in responses by community type, we find that urban residents expressed more interest in many services, such as library kiosks, digital media labs and library-related cell phone apps, than suburban and rural residents. Read more in our new report, Library Services in the Digital Age.